The Klaus Tschira Foundation (KTF) was founded in 1995 by Klaus Tschira. Over the years, it has become one of the biggest private nonprofit foundations in Europe. For their anniversary year, the KTF institutions have drawn up a special program. The first event was a scientific symposium, hosted by the Heidelberg institute for Theoretical Studies (HITS) at the Studio Villa Bosch. 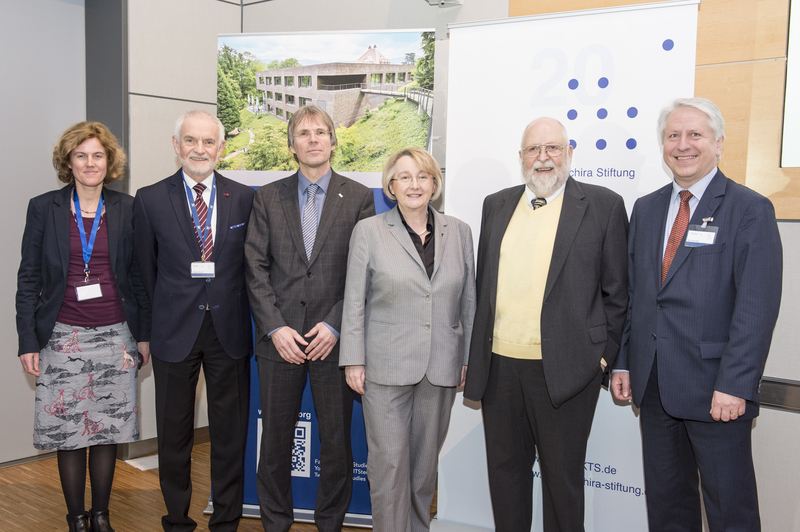 Prof. Bernhard Eitel and Prof. Holger Hanselka, Rectors of Heidelberg University and Karlsruhe Institute of Technology (KIT), also attended the event. Both universities are working closely together with HITS. Examples are their joint appointments for new professorships and graduate schools. Since the beginning of 2015, Heidelberg University and KIT are also shareholders of HITS. 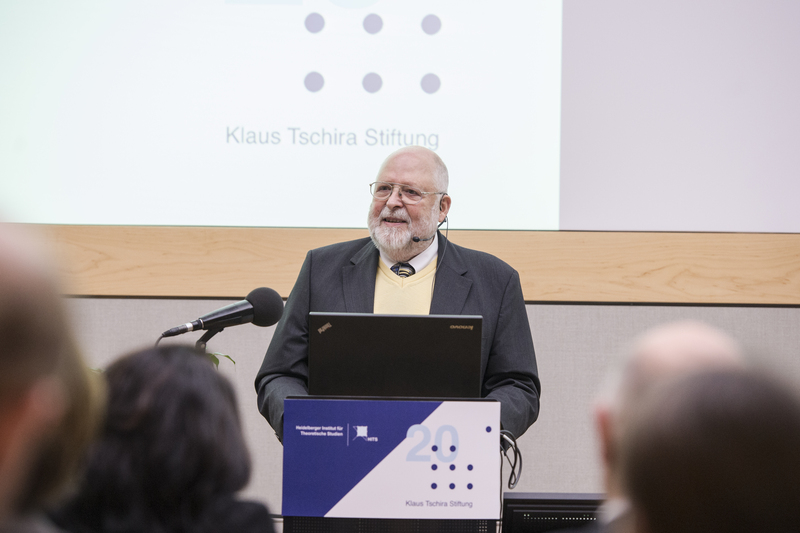 “Klaus Tschira is a founder, patron and donor to Heidelberg University,“ said Bernhard Eitel. “We really appreciate his unprejudiced and science-oriented approach. He is excited about new findings and shows us how much he enjoys it when we are able to discover, develop and pass on new findings thanks to his support”. During the event, HITS’s eleven research groups presented their fields of research – from astrophysics to cell biology – with hands-on demontrations, posters and videos. Astrophysicist Prof. Mark Vogelsberger (MIT Massachusetts Institute of Technology) and biophysicist Prof. Jeremy Smith (Oak Ridge National Laboratory, Tennessee) gave scientific speeches. Both scientists cooperate closely with researchers from HITS. Their presentations showed how so-called “data-driven” research provides opportunities for natural science by using mathematical modeling and computer simulations. Prof. Mark Vogelsberger presented the “Illustris“ simulation – the currently most detailed illustration of how galaxies evolve. This simulation is the result of joint research between Prof. Vogelsberger and HITSter Prof. Volker Springel who wrote the code for the simulation. Prof. Jeremy Smith talked about the range of possibilities so-called „computational science“ offers, from analyses in the field of environmental protection to the development of new drugs. Prof. Rebecca Wade, Scientific Director of HITS, has been doing research on such pharmaceutical applications of computational science for a long time and has also worked together with Prof. Smith. The piano trio aisthesis / KlangForum Heidelberg provided a wonderful musical accompaniment for the symposium. 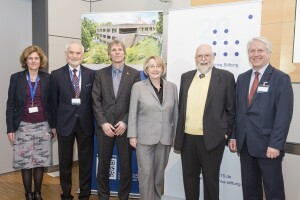 The Heidelberg Institute for Theoretical Studies (HITS gGmbH) was established in 2010 by SAP co-founder Klaus Tschira through his foundation, the “Klaus Tschira Stiftung”, as a private, non-profit research institute. HITS conducts basic research involving the processing structuring and anaysis of large amounts of data in the natural sciences, mathematics and computer science. The research topics range from molecular biology to astrophysics. Shareholders of HITS are the “HITS-Stiftung”, Heidelberg University and the Karlsruhe Institute of Technology (KIT). HITS cooperates with universities and research institutes, as well as with industrial partners. The prime external funding sources are the Federal Ministry of Education and Research, the German Research Foundation and the European Union.